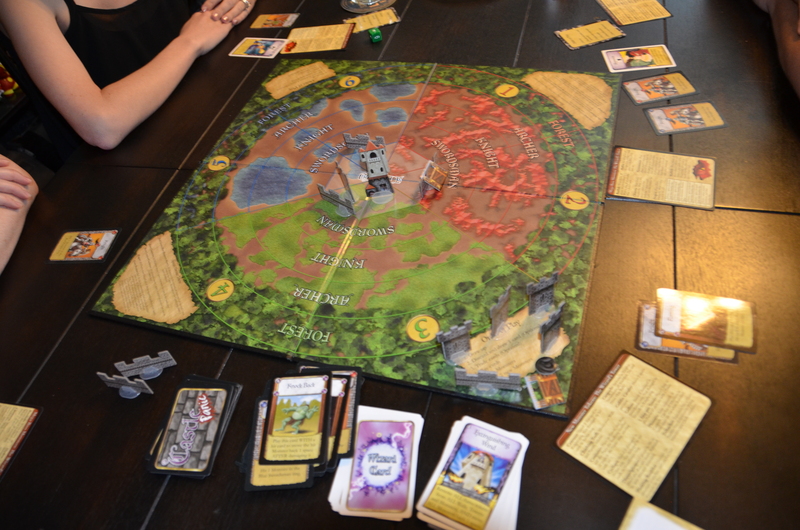 For my birthday, I had a few friends over, and we ended up playing Castle Panic (one of my favorites!). The Professor and I were the only ones who had experience with this game, and we suggested we play with our cards face up on the table. This let us talk out a lot of the strategies and answer questions the new players had about their cards. 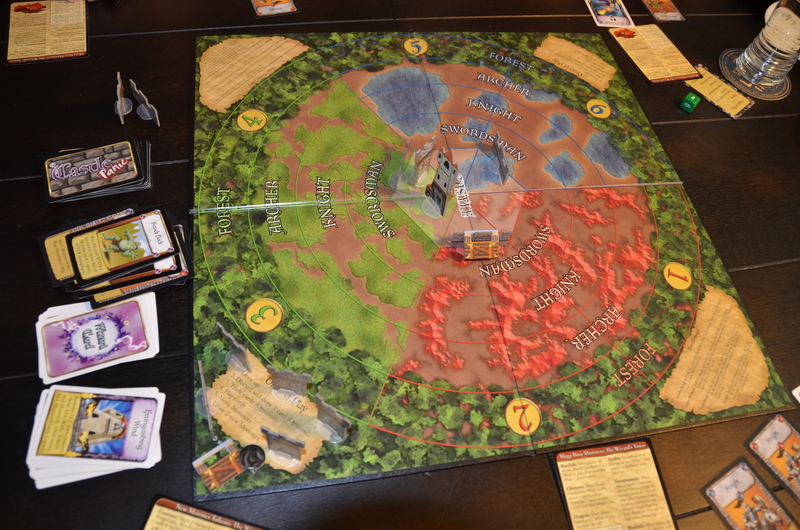 We had some unlucky Monster draws at the beginning of the game (Giant Boulders, Flaming Boulders, Plagues, and Draw Additional Monsters), but found the Wizard Deck to be extremely helpful in dealing with the repercussions. Smurfette also had a few awesome turns that helped keep the monsters at bay. Things were beginning to look bleak, though. We had three walls left (all had been rebuilt at some point and one reinforced), and just two Towers (one being the Wizard Tower), but we managed to pull off a win. Mermaid thought it was fitting that I dealt the final blow, it being my birthday and all. We play this game so often (in fact just a few days later The Professor and I played with the new Dark Titan expansion), that I guess we didn’t realize that there can be some confusing elements to the game. A couple of our players had some trouble with the differences between space and arc and color and arc. Certain cards have text like “Damage all monsters in the same space for 1 point” and this was often confused with “Damage all monsters in the same arc for 1 point.” Similarly, there were a few instances where our new players thought the arc was one entire color section. The other element that was often asked about was if cards could damage monsters in the Forest and/or Castle rings. Some cards list exactly which rings the card can be used it (Heroes for example list the Archer, Knight, and Swordsman rings), and other list which rings are excluded, like the Forest. There are a few cards which don’t do this, and instead have an icon or icons in the top left corner to indicate that they can be used in the Forest and/or Castle rings. It’s a little bit of an inconsistency that can be confusing to new players. Mermaid commented that it wasn’t what she would call an easy game, but it did get easier the further into the game we got.